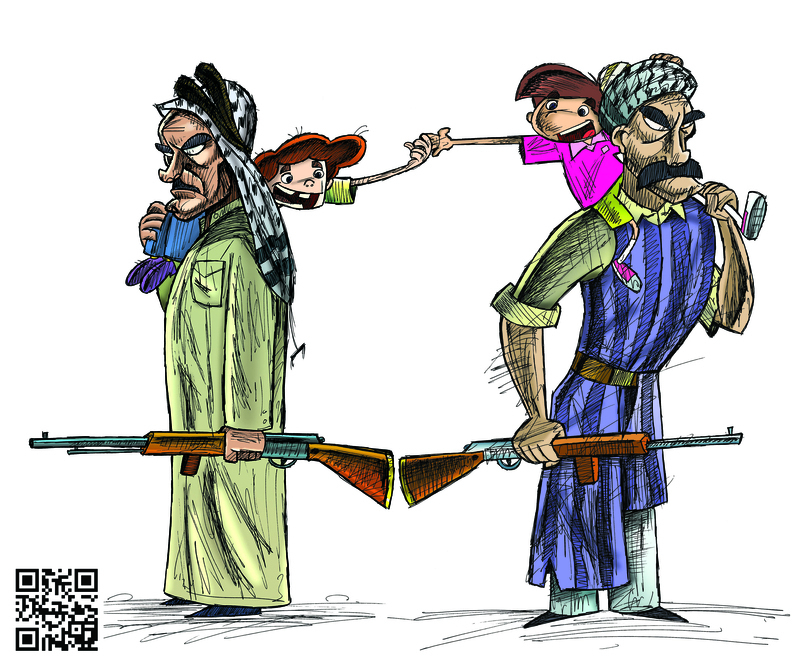 September 30, 2015 Interview: the anonymous group Daafish and their satirical cartoons against IS. 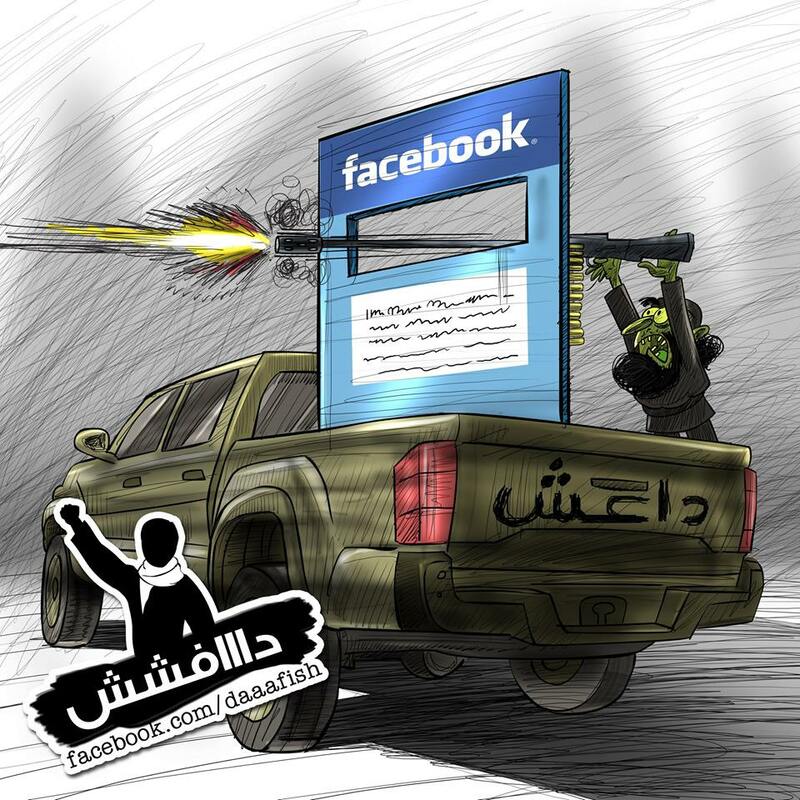 Daafish is a group of anonymous Iraqi activists, who create and publish satirical cartoons about the so-called Islamic State (IS) on Facebook. Since launching in April 2015, they have built a tremendous following across the country and beyond. 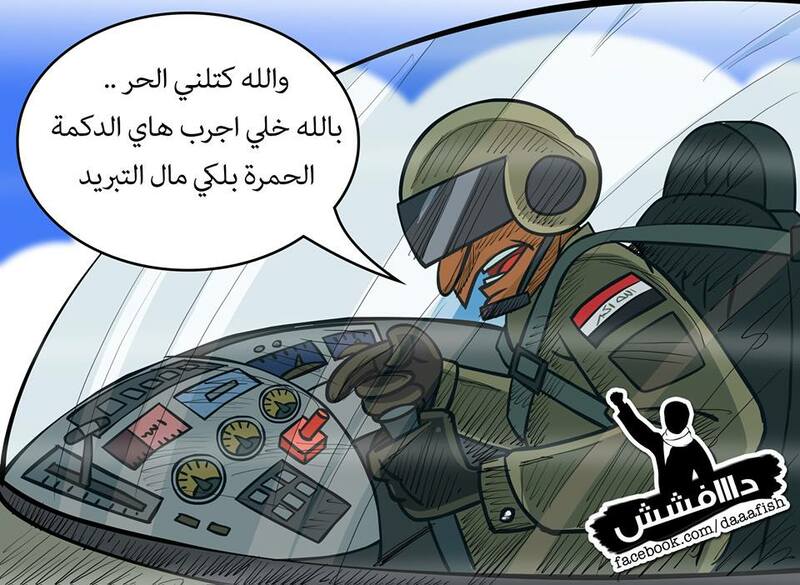 Audiences in IS controlled territories have reached out to them with ideas for new satirical cartoons—while supporters of IS send them scathing hate mail. A Daafish member talks to Ruya about their work, and their social media battle against Islamic State. 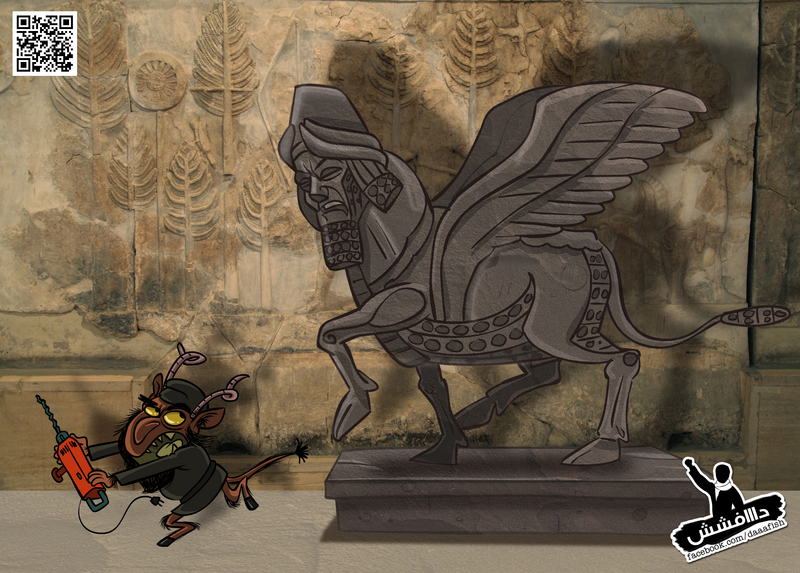 Daafish responds to Islamic State’s destruction and looting of ancient Iraqi artefacts. Daafish, 2015. Courtesy of the artists. You all live in different cities in Iraq and Turkey. Most of you have never met. How do you work together? We all have different roles, drawing, social media or video editing. We meet online, on Skype or Facebook and discuss ideas for new cartoons. I sometimes meet two of the members who live in the same city in local coffee shops to talk about the project. We sketch new ideas on paper or directly on the computer and discuss it together again. We use Wacom Digitizer for drawing as well as Adobe Photoshop and Adobe Flash. We vote on each drawing together as team members, and publish the ones that are approved by the majority. Why did you start making satirical cartoons about IS? IS work a lot on social media and use fear to intimidate people so they won’t stand up to them. We wanted to fight back against their propaganda. How do you get ideas for these cartoons? We follow the news about IS controlled cities across Iraq. Many people living in Mosul have also reached out to us with news from the city. Why is laughter an effective tool or “weapon”, as you say, against IS? Jokes are a good weapon. When we laugh at IS, we overcome our fears. We are reminding people that IS are not sacred and will not be around forever. What do the people living in Mosul tell you about IS controlled areas? How do they reach out to you? They reach out to us anonymously through many different platforms. They tell us about IS behavior in the city, both good and bad. The bad things relate to physical and psychological oppression, corruption, exploitation of Islam for personal benefit, manipulation of children, brutality as a political tool etc… The good things mainly relate to municipal activities such as street cleaning and construction projects. Even these seem tinged with corruption though: for example, IS apparently use the rubbish collection to identify and illegally appropriate houses from people who have fled the city. So even though IS are good at propagandizing these superficial activities, the people see through it and hate them. They reach out to us with their views, which gives us the chance to be the voice they don’t have. How have people reacted to Daafish? People in Iraq are tired of watching the news and graphic images, they want something that will make them laugh, and that is why they like Daafish. We have a lot of followers mostly from Iraq but also in Syria, Jordan, Lebanon—countries also engaged in fighting IS. Over 7,000 people liked our cartoon of a pilot accidentally dropping a bomb. My family even sent it to me on Whatsapp. I didn’t tell them I was involved in Daafish. What about comments from IS and their supporters? Supporters of IS often leave comments to attack us, I cannot be 100% sure that some of them are actual fighters. They tell us we are opposed to Islam. It is clear from their comments they know nothing about Islam – or someone is teaching them a warped version – so their comments just make me laugh. You’ve launched a new series about a taxi driver in an Iraqi city. It is not about IS or about politics or war. What influenced it? We wanted to try something different, not just focused on IS, for our fans and followers. For Ramadan, we created a daily cartoon about a taxi driver and the problems that he encounters on the street, in his car, in the traffic, at check points. We have many stories about taxi drivers in Iraq; he is a well-known stock figure. 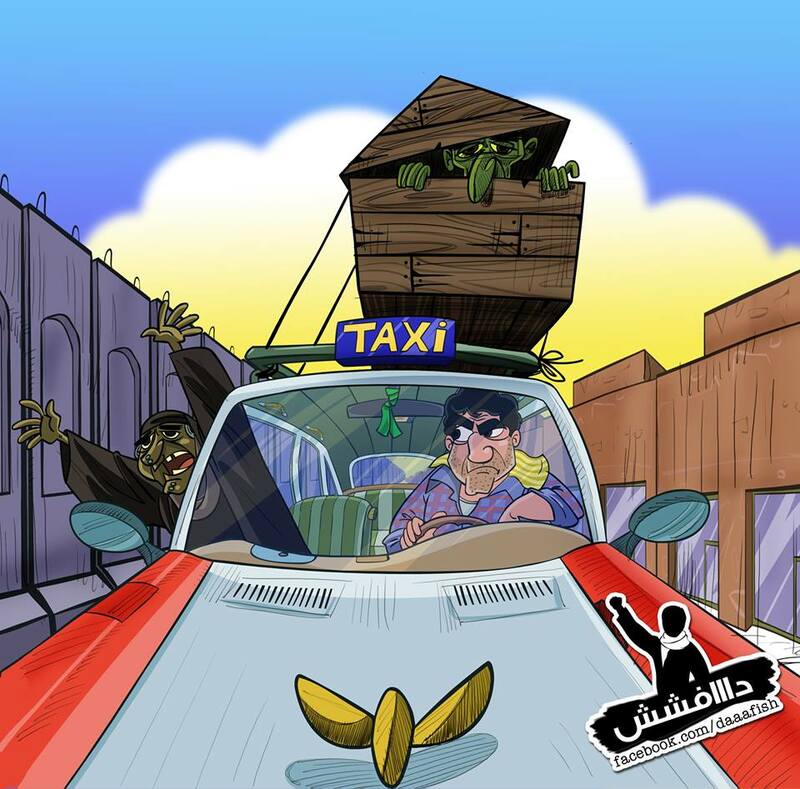 Daafish’s cartoons about an Iraqi taxi driver, 2015. Courtesy of the artists. An Iraqi army pilot mistakes the red button in his fighter jet for air conditioning. Daafish, 2015. Courtesy of the artists. You yourself engage with a lot of bloggers and online commentators. Why are these an important source for you? Blogs and social media channels are free—unlike newspapers or television—and citizen journalism is important, particularly if we want to encourage people to take action. In Iraq, we love using these channels because it is difficult to connect with people. There are no safe places. The security situation makes it difficult to meet with people. What is your favourite Daafish cartoon? I want to send a message of peace and unity, despite the sectarian war, so my favourite cartoon is the one about unity. Two children hold hands as a message of peace and unity in Iraq. Daafish, 2015. Courtesy of the artists. We would like to inspire more talented artists and young Iraqis to speak up. People are already sending us their stories and ideas. Now we want artists or aspiring artists to send us their work so we can promote it. We hope to gather around us all those who share our ideal of a united, strong Iraq that is fighting for a better future.